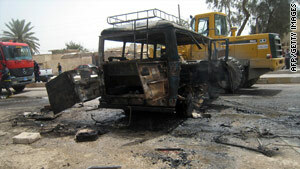 A bus devastated in a suicide bomb attack Monday south of Baghdad. Baghdad, Iraq (CNN) -- At least 85 people have been killed and nearly 300 wounded in a string of bombings and shootings across Iraq, the country's Interior Ministry reported late Monday. Attacks were launched in six provinces, including Basra, Wasit and Babil -- which tend to be less violent than others -- in violence reminiscent of what was typical during the height of the sectarian war. In the northern city of Mosul, a suicide car bomber killed two at a checkpoint manned by Kurdish Peshmerga forces. Many of the shootings and bombings targeted security forces. The deadliest attack happened in Hilla, in the southern province of Babil. Three bombings there killed at least 36 people and wounded 140. First came a double car bombing that killed at least 23 people and wounded 110, the Interior Ministry said. The a suicide bomber struck as medics and security forces responded to those blasts, killing and wounding more. The first two bombs in Hilla detonated near a weaving factory busy where employees were leaving work. Other attacks happened in Baghdad, Mosul, Falluja and in cities north and south of Baghdad. The attacks come at a critical time in Iraq, as the country is struggling to form a government after contentious national elections, a process that Western officials have described as "lagging." No one has claimed responsibility for Monday's attacks, but such coordinated assaults bear the hallmarks of al Qaeda in Iraq, which is known to take advantage of political fissures to carry out attacks to create turmoil. Iraqi and U.S. security forces have reported significant progress recently in their battle against al Qaeda in Iraq. They recently said, for example, that a joint U.S.-Iraqi operation killed the organization's two top leaders, Abu Ayyub al-Masri and Abu Omar al-Baghdadi. Security forces in similar joint operations have killed or captured 32 of 42 senior leaders of al Qaeda in Iraq, U.S. officials have said. Yet the group has proven resilient in the past, partly by regrouping and continuing to try and foment sectarian violence. The series of attacks on Monday started as the day dawned in Baghdad. Gunmen opened fire on police and army checkpoints in the eastern and western parts of the capital between 5 a.m. and 6:30 a.m., killing four police officers and three soldiers and wounding 12 members of the security forces, the Interior Ministry said. Three roadside bombs struck police checkpoints and a patrol in Baghdad. These attacks killed two civilians and left 10 people wounded, including nine police officers. At least eight people were killed and 28 wounded in a double bombing south of the capital. A parked car bomb followed by a roadside bomb detonated in the town of al-Suwaira near a market and a Shiite mosque, the Interior Ministry said. The town is a predominantly Shiite. In al-Tarmiya, north of Baghdad, a car bombing killed at least three people and wounded 16 others. The parked car bomb was targeting the mayor of al-Tarmiya, who was among the wounded. In the city of Falluja, four people were killed and at least 10 civilians were wounded when four roadside bombs were detonated outside the homes of four police officers. Gunmen wounded four police officers in an attack at checkpoints in Baghdad, and a roadside bomb hurt two people on the northern outskirts of the capital. In the neighborhood of Old Basra in that southern oil-rich city, at least nine people were killed and 18 others were wounded Monday evening two parked car bombs exploded in different neighborhoods, an Interior Ministry official said. The first one detonated near a market in the neighborhood of Old Basra killing at least seven people and wounding 18. The second bombing shortly after that in a different residential neighborhood killed at least two people. Witnesses told CNN a curfew has been imposed and security forces deployed across Basra. In the northern city of Kirkuk, a Sunni Sons of Iraq leader was killed when a bomb attached to his vehicle detonated in the southwestern part of the city. And at least eight people were wounded when a parked car bomb detonated south of Baghdad in Mahmoudiya south of Baghdad Monday evening. Mahmoudiya is a predominantly Sunni town, part of what formerly was known as the Sunni Triangle, and an al-Qaeda stronghold at the height of the sectarian war. Overall, violence across the country has dropped significantly over the past two years, compared with the height of the sectarian violence in 2006. However, attacks on civilians and security forces are still frequent.